DOCTOR WHO: Behind The Sofa - STATE OF DECAY | Warped Factor - Words in the Key of Geek. Andrew Jero starts a new series looking back at some of the Doctor Who stories that as a child saw him, and countless other children, watching from the comfort of behind the sofa. 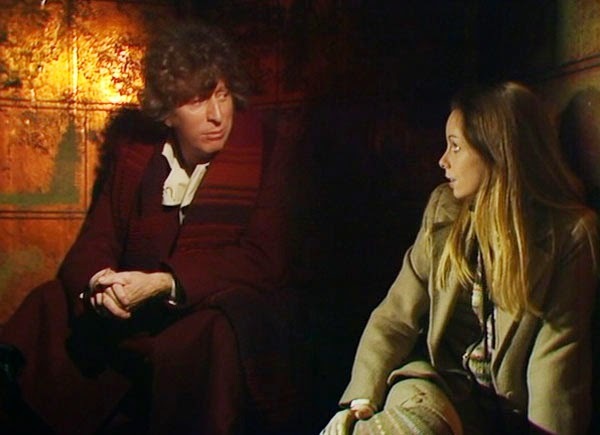 Doctor Who, amongst being famous for its use of cliffhangers, new scientific ideas such as regeneration and dimensional transcendentalism, is particularly known, perhaps not always in a positive light, for sending the kids behind the couch when the episodes got really scary. The first of these stories I’d like to talk about is the second of the E-Space Trilogy, State of Decay. Aside from residing in my top ten and being my personal favorite Tom Baker story, State of Decay still scares me to this day. Everything from the makeup, costumes and the set design makes this story as good as it is. When you take a brilliant script, pair it with arguably Doctor Who’s best ever director, Peter Moffatt, add some of the most beautiful sets ever built for the show you simply get nothing but the best. The dialogue is superb and Tom Baker is truly on top form. When I saw State of Decay for the first time I was four years old. Everything about this story, aside from K9 scared me. The atmosphere, music (one of my favorite scores of all time) and above all the Three Who Rule! 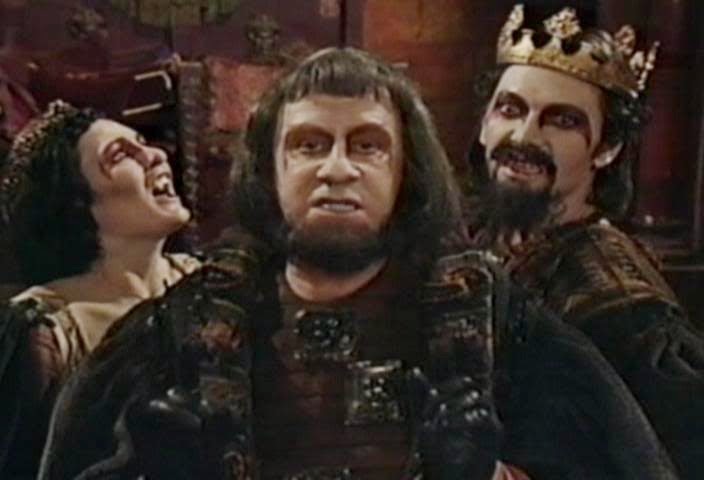 William Lindsay, Rachel Davies and Emrys James give superb performances as the last of the Vampires. 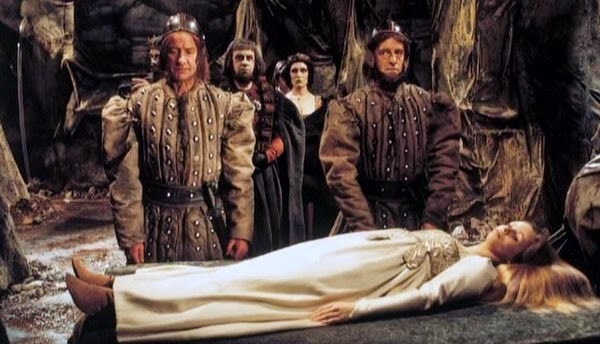 The first time I watched this I didn’t really pick up the subtle hints about the three being Vampires, Camilla obsessing about the drop of blood on Romana’s hand, the bat attacking the Doctor in the end of part one, the blood like makeup around the eyes of Aukon, Zargo and Camilla, and finally the husks right before the end of part two. Emrys James, on his own brings 75 percent of the overall atmosphere of the serial. His vocal inflections, facial expressions, everything adds to the darkness and gravitas of his performance particularly with the second cliffhanger. The third cliffhanger is without a doubt one of the most frightening in all of television. Terak dead, Camilla going after Adric, Zargo grabs Romana pulls out his knife lets it drop and is ready to feast! Absolutely bone chilling, brilliant material. The costumes designed by Amy Roberts are perfect and fit in with the colors of the set and reflect a sense of power amongst Zargo, Camilla and Aukon, something which heavily contributes to the atmosphere and success of the piece. I’ll admit that from the costumes, sets, music and the perfect acting in State of Decay I still have a hard time watching it without reverting back to my four year old self and having my skin crawl in fear of the characters and the very believable performances throughout. As the Doctor Who story that scares me the most, even now, I can’t help but to purposely watch it at around four in the morning, thunder and lighting outside, complete darkness aside from the glow of the television screen in my room. As a child I loved when Doctor Who would be fun and adventurous but when it went for the horror factor, it was the best. A small group of people threatened by some more powerful force makes for truly scary and fantastic television!